Just days ago, I received emails from my readers alerting me of a relatively new Blazing Trader scam. Every single one of them lost a couple hundreds of dollars to the trading software, so don’t be the next victim. If you are still considering to sign up for it, make sure you read this full Blazing Trader review before you go ahead. This article might just save you a few hundred dollars. The alleged founder of Blazing Trader software, Johan Strand claims to be a former professor of mathematics who has developed a binary trading software that makes profits automatically. 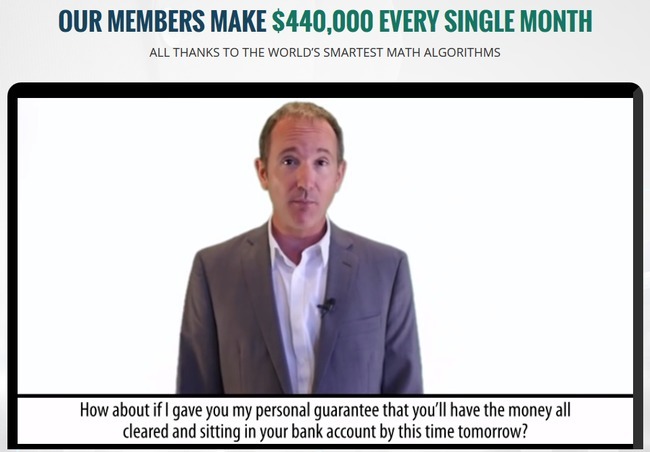 Just like any other online scams out there, Johan claims that his system is totally free, which is an obvious lie. If you encounter online opportunities that sound too good to be true, it’s better to do some thorough research before paying for them. They are most likely scams. With that said, there are ways to find out if an opportunity is a scam without having to pay for it. I’ll show you some evidence to prove that Blazing Trader is a scam. I found “Johan Strand” familiar when I was investigating Blazing Trader scam. Upon checking my past reviews, I found that he was featured in another scam called Polygraph Millionaire. 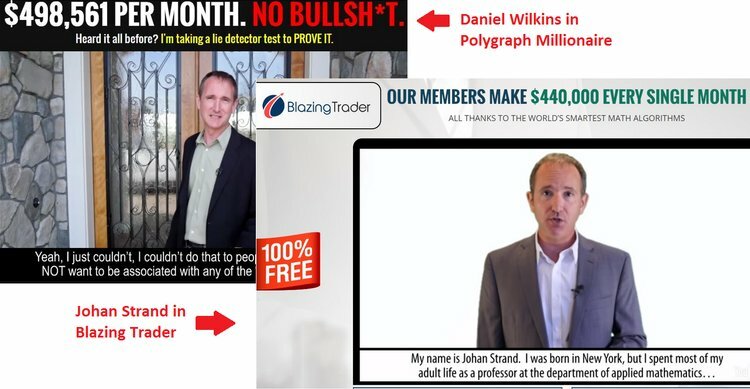 While he introduces himself as “Johan Strand” in Blazing Trader, he identifies as “Daniel Wilkins” in Polygraph Millionaire scam. Apparently, he is a professional actor who was hired to present these scams. In fact, hiring actors and actresses to promote online scams is more frequent than you think. I’ve reviewed other online scams that used the very same tactic to appear legitimate, such as Instant Cash Club and Dubai Lifestyle App frauds. Towards the end of the sales video, we can see a few video testimonials that invariably give very good reviews for Blazing Trader software. Knowing the huge number of fake testimonials on the internet, I conducted a background check on these featured members. I found that “Marla” from Croatia was actually an actress hired from a freelancing website, Fiverr.com for a fee. These semi-professional spokespersons sell testimonials for a living. 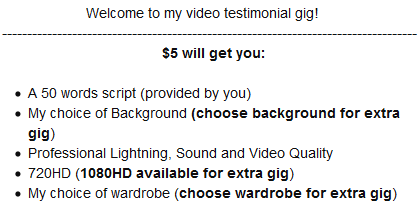 Let’s take a look at the Fiverr gig description of the actress above, where she sells a piece of video testimonial from $5 onwards. The clients (in this case the scammers behind Blazing Trader) provided her with a script, where she reads in front of the camera as if it’s a piece of real testimonial. What you see in the video wasn’t a real testimonial. 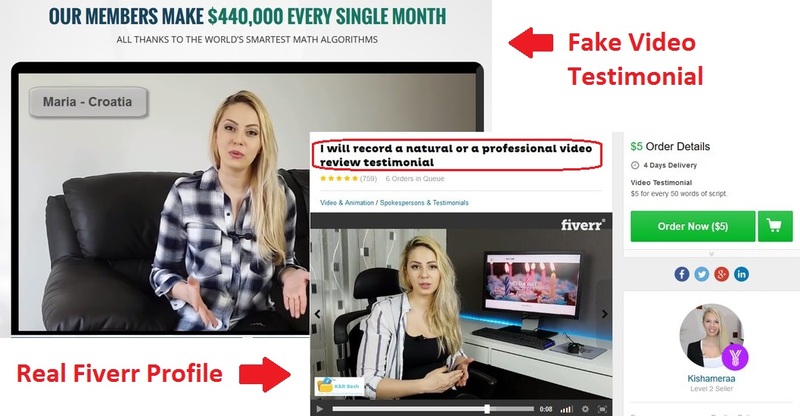 This Fiverr actress was just reading the script provided by the scammers. She has never used the software, much less profiting from it. Following this revelation, I’ve done the background check for all the members featured in these video testimonials, and every single one of them turned out to be a Fiverr spokespersons. Besides, if there are real members who are satisfied with the performance of the software, Blazing Trader fraud wouldn’t have to buy fake testimonials to promote the scam. I’ve reviewed more than 100 binary trading softwares, and each of them claims to be the only miracle software that can guarantee your profits. However, none of them have worked as advertised. They throw out fake guarantees like free candies, and you should be vigilant enough not to succumb to these lies. As much as Blazing Trader scam wants to keep you in the dark, they have to reveal the true nature of the scam somewhere in the website. They chose to hide the truth in the risk disclaimer found at the bottom of the sales page. Much like the hidden terms and conditions of some hideous products, Blazing Trader is hiding the truth behind the risk disclaimer above. Despite coercing you to sign up for the “free” money-making software, Blazing Trader denies inviting you to trade binary options. Note: Frauds that promise unrealistic returns like Blazing Trader are illegal in many jurisdiction. If they do not include this clause, they are deemed to illegally coerce you into signing up for the scam. Blazing Trader admits that trading binary options is extremely risky, and it’s your own responsibility if you decide to sign up and lose all your investments. NO REAL TRADES HAVE BEEN EXECUTED using Blazing Trader software. All profits quoted in the sales material are fake. If you decide to sign up for Blazing Trader app, you will be required to open a new broker account with their partner brokers, which are unregulated by monetary authorities. The losses are pocketed by the broker, which is then shared with its partner-in-crime – the scammers behind Blazing Trader system. BLAZING TRADER IS A SCAM. I strongly advise you to stay away from the scam if you don’t want to lose your hard-earned money. Thank you for laying out the evidence here! I was nearly convinced by all the testimonials and turns out there are all fakes! Can’t thank you enough! Hi Deanna, glad the review helped you!